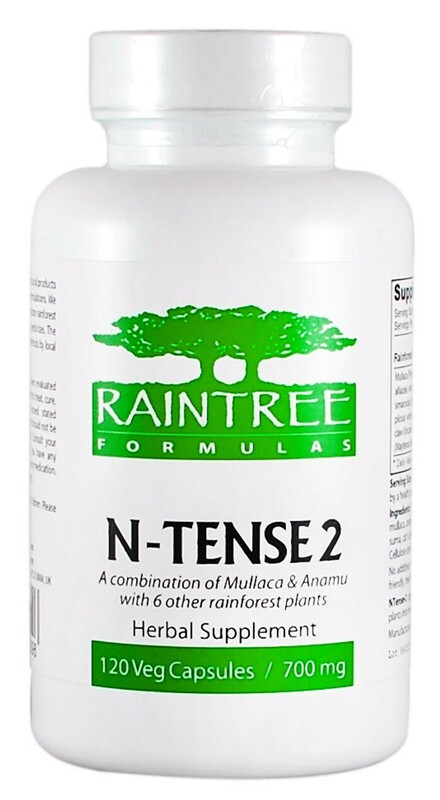 N-Tense 2 is a natural herbal blend of Mullaca, Anamu, Vassourinha, Simarouba, Picao Preto, Suma, Cat's Claw and Espinheira Santa. Clearance item, short dated stock, expiry date on this batch is July 2019. We will have fresh stock in the coming weeks. Please email us for further details. Recommended Daily Intake: 4-5 capsules 3 times daily, or as directed by a healthcare professional. Ingredients: A proprietary blend of mullaca, anamu, vassourinha, simarouba, picão preto, suma, cat's claw, and espinheira santa.